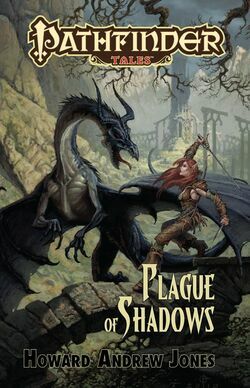 FlamesRising.com is pleased to present a behind-the-scenes look at the birth of the Pathfinder novel Plague of Shadows. This novel, which was written by Howard Andrew Jones, is about a race against time set against a backdrop of treachery, magic and nightmares. Jones dives into the process of writing a tie-in novel with both feet. In his own words, you can read how this talented author came to be a part of the popular Pathfinder setting. Round about the time James Sutter was given the greenlight to start up the new Pathfinder line word got around that I’d signed a two book contract with St. Martin’s Thomas Dunne Books for some Arabian fantasy swashbucklers. The first one, The Desert of Souls, was on its way through editorial when James contacted me to see if he could look at some writing samples. He must have liked what he saw, for he then asked me to shoot some proposals his way. In some ways, the proposal was harder than the drafting. James was very encouraging about my desire to write a straight-ahead sword-and-sorcery piece, but I must have sent a half dozen characters and a dozen concepts his way before we found something we both liked the sound of. I pitched him “Jirel of Joiry crossed with Unforgiven.” I wasn’t planning to lift the character or the plot, but I hoped to evoke a similar feel. Once my proposal had the greenlight, I sat down to draft a detailed outline for approval by James and the Paizo team. I wanted a clear through line to start with. 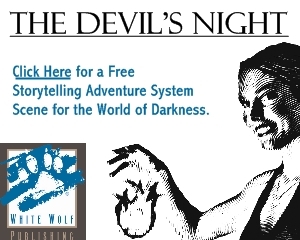 Once the plot got rolling, though, I wanted something a little more than the standard chase; I meant to play around with the expectations in this kind of tale and poke and prod a bit at motivations and standard gaming tropes like alignments and racial differences. When it came to choose a setting for the book, I went off the beaten track. I’m sure if I’d asked to write about more well traveled areas of the world of Golarion, I’d have been permitted, but I chose the wilderness, and the outskirts of revolutionary Galt, a nation evoking the worst characteristics of the French terror, complete with guillotines that not only execute the fallen, but trap their souls. I wanted a seemingly monolithic background evil against which the characters and their antagonist –an enemy, but no friend of Galt – would have to contend. Plague of Shadows was the first writing I’d done in someone else’s world, which meant there were new challenges. I’d never written anything with orcs or dwarves, and while I’d scripted an evil sorcerer or two, they’d never been Pathfinder magic users. Writing deals in a lot of archetypes, and fantasy gaming fiction tends to wear those archetypes proudly on its sleeves — the elven archer, the surly half-orc, the mysterious wizard. I embraced those archetypes and tweaked them, as any gamer would when designing a character for play. I planned out scenes that would put the characters in conflict so I could get a better handle on who they were and what was important to them. I started writing within a day or two of getting my outline approved, and pretty quickly I realized that I needed to stat out my main characters. I’ve been gaming regularly with a variety of systems since I was about 9, but in all that time, I’d never rolled up story characters prior to writing about them. Pathfinder has a whole host of skills, abilities, feats and spells, with some accessible only at certain levels, or after other feats or abilities are achieved, and I wanted to make sure that what I had my characters doing was possible in the game rules. I kept the rule book handy so that my spell descriptions would match, as closely as possible, the spiffy descriptions drafted by the Paizo maestros. For all that I adhered to the game system, I kept those details in the background. I didn’t refer to any spells by name, and people certainly didn’t talk about levels or hit points. I wanted the tale to be about the characters – the driven, rather haunted, noir elf, the honorable half-orc striving hard to walk a noble path when most who met him would assume the worst, the naïve but talented young noble, the charming, secretive, and secretly cowardly bard, the evil wizard with a code of honor – it was these relationships I wanted to explore over the course of the adventure. 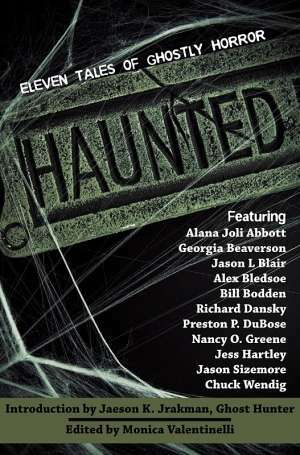 About Howard Andrew Jones: When not helping run his small family farm or spending time with his amazing wife and children, Howard can be found hunched over his laptop or notebook, mumbling about flashing swords and doom-haunted towers. He has worked variously as a TV cameraman, a book editor, a recycling consultant, and a college writing instructor. He was instrumental in the rebirth of interest in Harold Lamb’s historical fiction, and has assembled and edited 8 collections of Lamb’s work for the University of Nebraska Press. His stories of Dabir and Asim have appeared in a variety of publications over the last ten years, and led to his invitation to join the editorial staff of Black Gate magazine in 2004, where he has served as Managing Editor ever since. He blogs regularly at the Black Gate website and maintains a web outpost of his own at www.howardandrewjones.com. The Desert of Souls is his first novel, though Plague of Shadows followed close on its heels.